Sometimes people like me can be self serving. I wonder when I am going to get my next ride in, can I schedule a trail run, how many ski days do I have so far? It seems like life sometimes is a series of athletic events blended in with work, family, and obligations. Enter the Famous Bope Ham. You are probably wondering,” What on earth is the Famous Bope Ham?” Well simply put, it is absolutely the most tasty baked ham you will ever enjoy if you are fortunate enough to have a slice someday. It is the creation of my mother-in-law and the recipe has been passed down to my wife Janet who prepares it flawlessly. 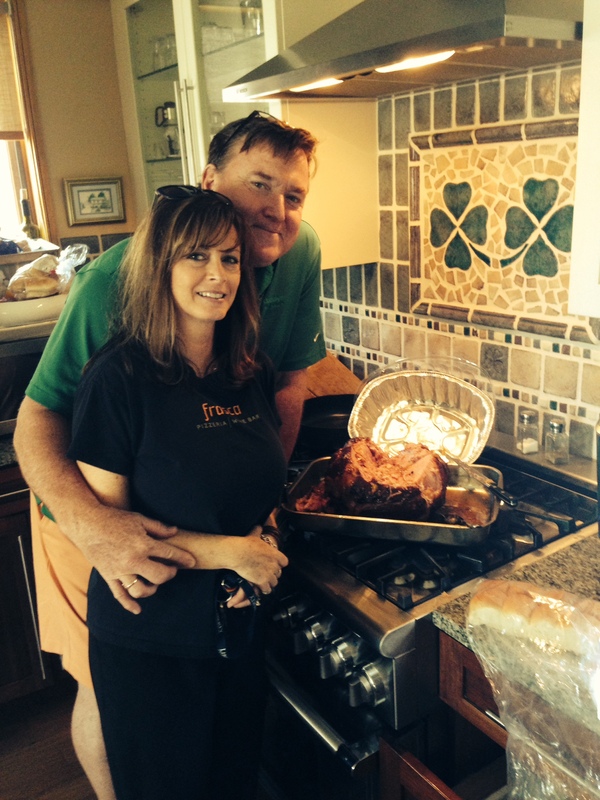 The picture above is Janet and our good friend Mike Dunlay with the ham. Janet brought it over to feed Mike and his family during the time when they were celebrating the life of their father who had passed away. The ham is comforting. When people see it for the first time at a funeral or if someone is ill, a smile lights up their face when they cut into the baked outer crust and dip a piece into the sweet sticky juice at the bottom of the pan. Suddenly, all the sadness, discomfort of an illness, or other maladies disappear at least for the moment as one savors a bite of this tasty comforting food. The ham appears courtesy of my loving and thoughtful wife who bakes the semi-boneless delectible meat all day or all night in the oven at low heat. The ham is scored and cloves are placed at the intersections of the scores,and finally according to the recipe, brown sugar and orange marmalade are placed on top of the cooked ham to melt and blend with the ham juice to form a most wonderful sweet, gravy. When the ham appears at an event, things come to a screeching halt as the host graciously acknowledges the gesture of my wife Janet and like a magnet, the guests in the home march like Zombies towards the treat. It is mesmerizng to be sure and when the first people slice the ham, dip the slices into the sweet gravy and eat, their eyes close with unbelief. They are hooked under the power of the Famous Bope Ham. Holidays at my mother and father in law’s house always include the ham and when I am particularly famished after a great day on skis, a great run or ride, I am always delighted when my plate is filled with slices of this most delicious and filling meal. But here I go again with the self serving. It is not about me and my hunger, it is all about the ham. The Famous Bope Ham is more than a tasty treat delivered to a grateful home. It represents love, caring, understanding, giving spirit, all wrapped up in a sticky, sweet, tender goodness that binds families and friends together. Perhaps no illustration could be better than when we take the ham to serve the families at the Ronald McDonald House in Pittsburgh. We bake the ham all day and get all the side dishes, drinks and desserts together and make our way to the House and get the meal to the penthouse where the families reside. If you ever feel like you want to serve people, look no further than the families who reside at RMHC. Oftentimes, they are there for weeks, months, and longer waiting for a liver transplant for their child. Perhaps their child has a debilitating illness that the good doctors at UPMC-Children’s Hospital treat over time. Oftentimes, these scenarios are life threatening and the families are not sure of the outcome. They only know that their children are in the best of care at Children’s Hospital and have a wonderful place to stay courtesy of the volunteers and staff at the Ronald McDonald Houses. There is no greater feeling than seeing a young person who is battling illness, walk into the dining room and partake of the ham. When they eat that first bite, the smile on their faces and their bright eyes looking at us brings out the bladder behind my eyeballs for sure. It is a most hearwarming moment and if only for a short while, we feel like we have made their life a little easier and their families are most grateful for the appearance of …….the Famous Bope Ham. It is more than a meal. It represents all that is good with not being self serving if only for a short while. Janet and I love those families and pray for them every day. And the ham……….once again,appears out of the oven to serve and delight the most grateful recipients. My mother always said that happiness is like a perfume that you can’t sprinkle on others without getting a little on yourself. When Janet serves the ham, and people enjoy, that perfume of happiness definitely is in the air. Thanks for reading and please support RMHC Charities. This entry was posted in Uncategorized and tagged Cooking, Cycling, Food, Ronald McDonald House Charities, Running, Skiing. Ahhh…The Bope Ham…like my Aunt Joan, my sweet cousin Janet Lee… all “classics” Paddy Mac and we are surely sweeter by them all. Thanks LAF. Great family. Great ham. Oh that ham looks good! Bet it tastes better! You certainly hit the jackpot when you married into Janet’s family! And in that picture, she could pass for a co-ed at Penn State! What a great tradition! Thanks Hutch on all fronts. Someday you will have to sample that ham.